Note from Pam: Rachel’s apple pie is truly wonderful. She first made it for me over 3 years ago when we ate an al fresco summer dinner. Her crusts are crisp and subtly flavorful, but the apple filling steals the show. It’s sweet and just a little crunchy. I’ve eaten her apple pie for 5 consecutive breakfasts. It gets me out of bed in the morning. P.S. You may remember Rachel from her last, wildly popular guest post on Twice Baked Potatoes! Pam and I have wanted to make pie for a very long time. After a long struggle with what kind of pie we would make, Pam and I decided on a Dutch Apple Pie. Obviously, Pam is an extraordinary cook, but there are only a few things I do well: Potatoes and pie. I learned to make pie in high school from my Grandma Patrick. My Grandma is the oldest of eight children and her pies won numerous 4-H and Michigan State Fair prizes. 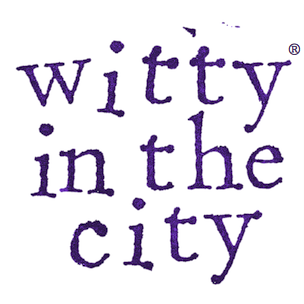 Her greatest honor, however, was being crowned “Homemaker of the Year.” Therefore, it goes without saying that pie making is an important part of my culture, and I am honored to share the Patrick family recipe with Witty in the City! I always start with the crust to build the pie up. First, combine 2 cups of flour and 2/3 of a cup of Crisco shortening. In The Help, Minny rattles off the variety of uses for Crisco (everything from preventing diaper rash to making fried chicken), but in this story, Crisco is also indispensable no matter your loathing for the fattening white goo. If you wish to feed this pie to someone who is fat-averse, you may want to hide the Crisco and say you pre-bought the dough…(sorry, David). 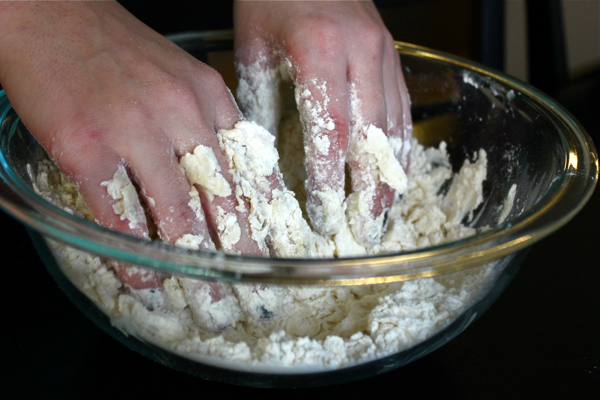 Mix the flour and Crisco with your hands, you want to get the dough to look like a lot of little pills. Then add ¼ cup of COLD water and a dash of salt. Get your hands back in there and mix the ingredients until the dough is very sticky. 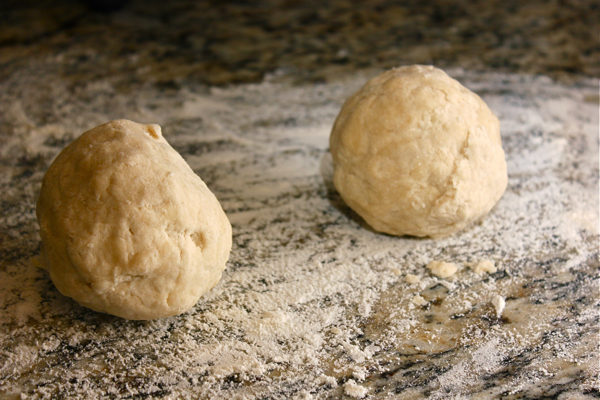 Then, form the dough into two even balls. Once you have your balls set up, cover your counter with flour and grab a rolling pin. Pam and I were having a bit of difficulty with a sticky rolling pin so we continued to add flour until the dough rolled out thin enough to form the crust. Grease the pan and place the dough in. Don’t worry if your crust is not looking pretty. You may need to push, pull, and pry the dough to line the entire bottom and up the sides. Our crust looked like it had leprosy, but it tasted amazing just the same. Now you are ready for your filling. For apple pie, you need about 6 medium-sized apples. My mother gave me a great tip when picking out apples: Grab a few different kinds. You will definitely need some “baking” apples like McIntosh or Cortland. 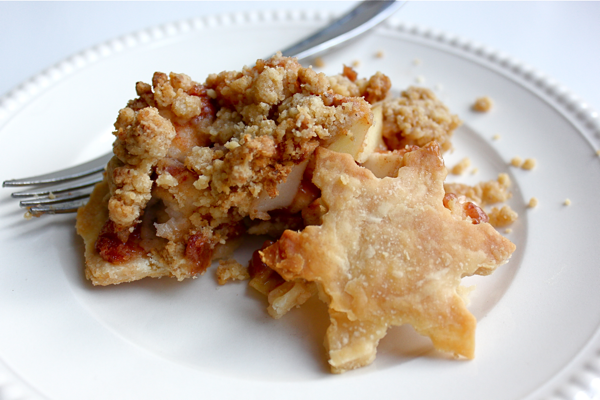 But then you can add in the crispier apples to give the pie a really complex flavor, however, I would not go as crisp as a Honey Crisp because crisper apples will release less juices when baking. For our pie, we grabbed 3 Cortland, 2 Gala, and 1 Red Delicious. 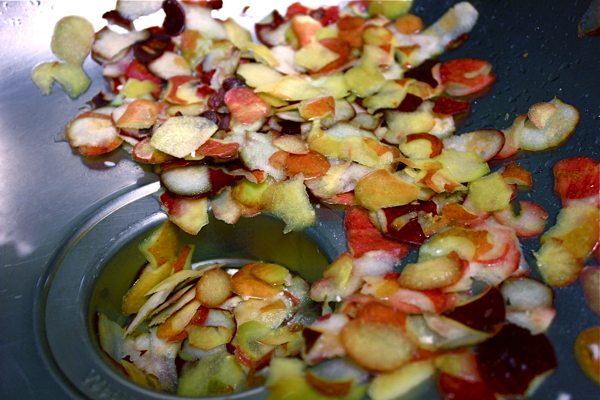 Peel all of the apples and cut them into 1 inch bites. 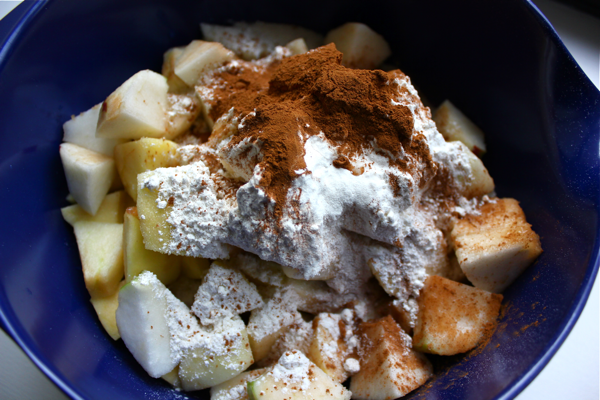 Then, add 1 cup of sugar, ½ cup of flour, 1 tablespoon of lemon juice, and 2 teaspoons of cinnamon. 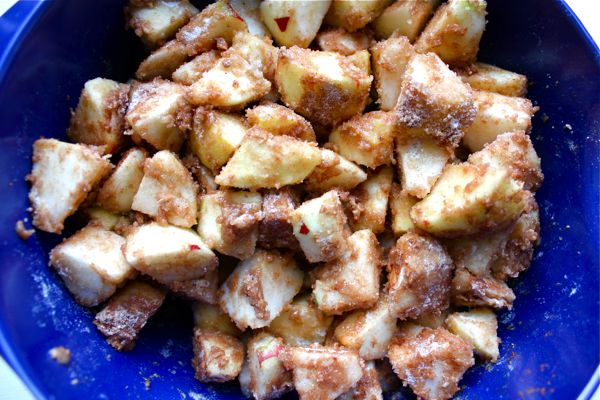 Mix well until the apples are coated in the mixture. Slowly scoop the apples into your crust and feel free to pile them on high because they will condense when baking. Note, you will need to cook the pie pan on top of a cookie sheet to make clean up easy because the pie is likely to spill over. Now you have two options: Either cover the pie with the other ball of dough or make a Dutch Apple pie with a crumble top. Pam and I couldn’t decide so we did a little of both. 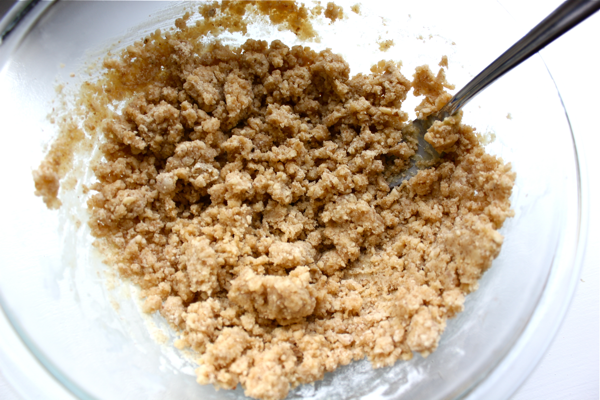 To make the crumble, combine 1 cup of flour, ½ cup of brown sugar, and 1 melted stick of butter. 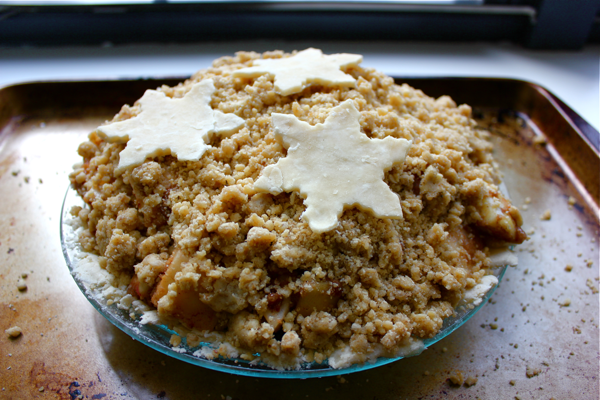 You can take the crumble to a whole new level by adding some crushed nuts. Pam and I added some walnuts, but pecans or almonds also add a lot of flavor…it totally depends on what you are craving. 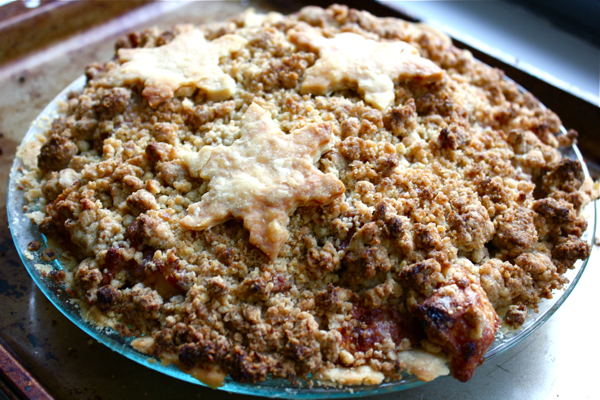 Finally, mix it together with a fork to get the nice crumble consistency, and then, pour it over the pie. For our finishing touches, we rolled out the other ball of dough and cut out snowflakes to add to the top (which was slightly ironic because it was 60º outside in mid-January). 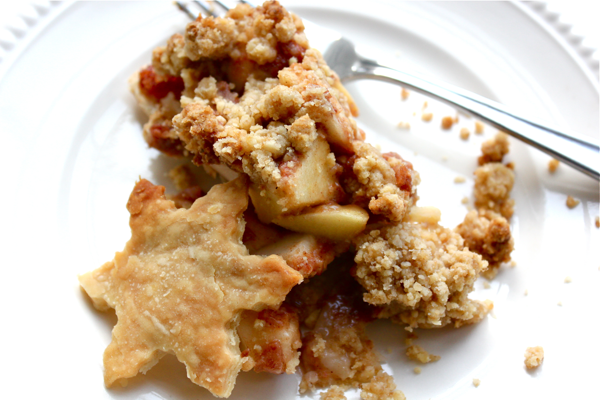 The crunchy bits of pie crust are a great treat. Now you are done! Bake the pie for 1 hour at 350ºF or until the top is golden brown. Let the pie cool for at least 30 minutes and then enjoy! David, you are giving me another surprise. You can bake!!! WoW! The pie looks scrumptious. Your grandmother’s name was Patrick? How come? Isn’t that a male name? You and Pamela are a pair of chefs. Instead of putting flour on your counters and making a big mess, use a sponge to wet the counter down a bit then put a sheet of wax paper down. 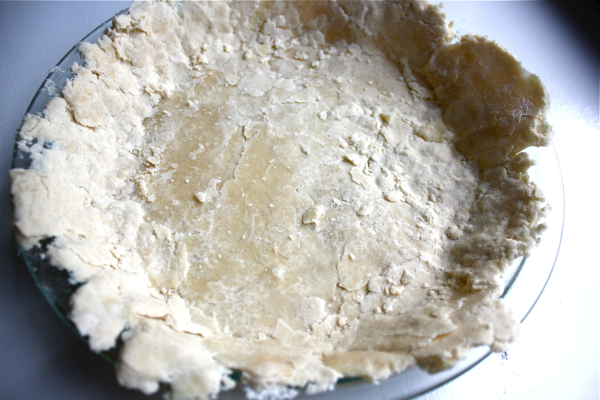 Then, put your ball of pie crust on top and place another sheet of paper over it. Then role out your dough and voila! My family has a pie contest each Thanksgiving. This will be the 24th annual contest. All the guys make a pie and the wives,girlfriends, granddaughters etc. judge the pies. (presentation, sliceability taste and our answer to some odd ball question made up by the judges determines the winner) I’ve choosen “Rachel’s Award-Winning Apple Pie” as my entry. It will be up against nine other pies. I’ll keep you posted as to it’s rating at the end! Rachel and I really hope you win!! Let us know how it goes!